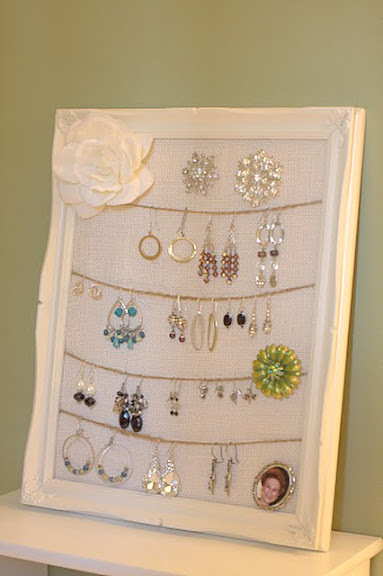 How to make an earring holder using a picture frame! I have a lovely jewelry box that has many compartments for earrings and bracelets. I found myself often tossing my earrings in the provided squares and they would pile up and get all tangled together. With the pile up of dangling earrings, I had many I could not easily see! I needed a way to hang them, so I could easily grab them when getting ready for the day. My solution? 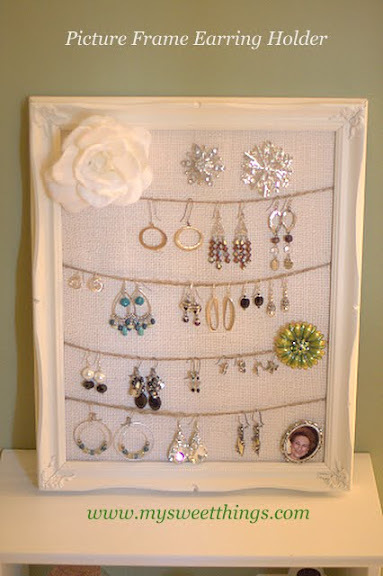 A picture frame earring holder! I had an old gold picture frame I picked up from a thrift shop that I knew would be perfect for this project. I spray painted it Heirloom White. 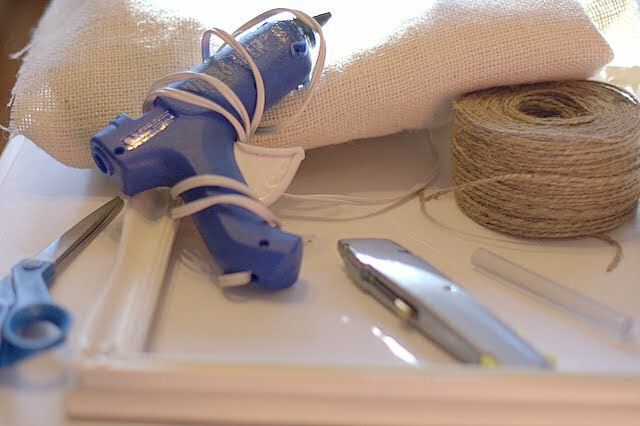 For this project I gathered my hot glue gun, glue sticks, burlap, scissors, a utility knife, some twine and a piece of white foam board. All these items I had in my stash but they can be purchased at your local craft store. 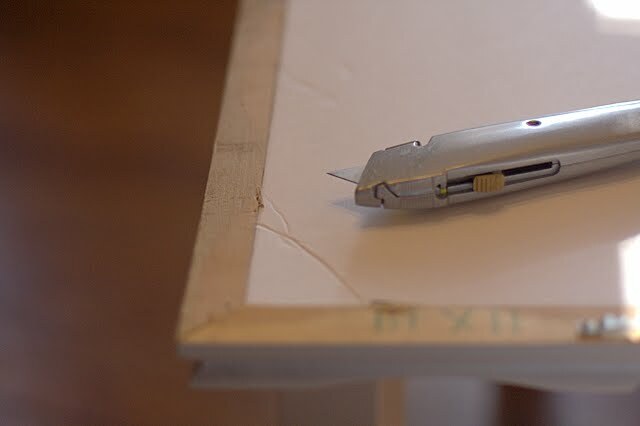 I placed the foam board inside the picture frame and cut along the edges using my utility knife. This frame had no glass piece for it and the glass is not needed for this project. After I cut the foam board to fit inside the picture frame, I cut the burlap allowing the burlap to overlap the foam board. 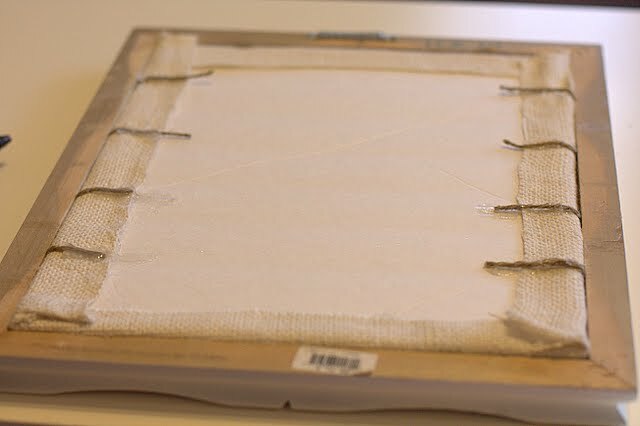 I used my hot glue gun to wrap the burlap around the frame. 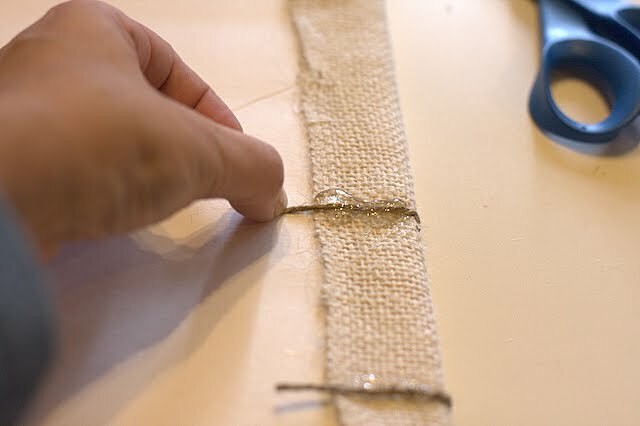 I then used the twine to make rows across the burlap leaving enough room between the lines for my dangling earrings. (I placed one of my earrings between the lines so I knew how much space to leave between each row.) The twine was hot glued to the back of the foam board. This is what the back will look like when you finish your twine rows and you have place the foam board back into the frame. 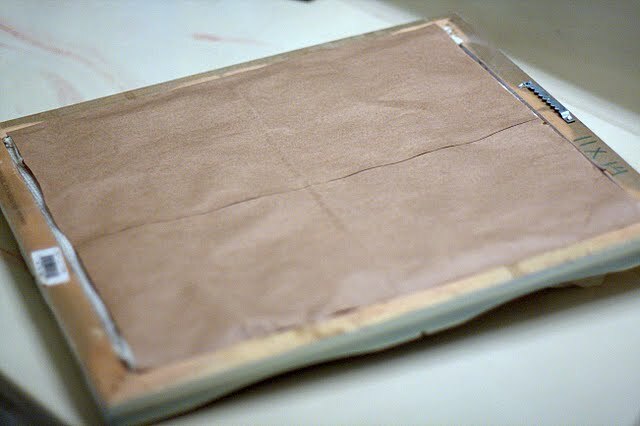 To finish the back, I used the back piece of a brown grocery bag. It’s my favorite go to with framing projects. I used the grocery bag trick for my Ceiling Medallion Mirror. I love it! I have been using it for a few months now and it works for me. I can easily see my dangling earrings and they are easy to pick up and place back at the end of the day. I also find myself changing up my daily earring selection since I can see them all now. I have also pulled a few brooches out of my drawers as they add a nice sparkle and they are too pretty to keep hidden away! Do you have a mad dangling earring collection? Do you have an easy solution for storage and display? I hope this inspires you to pull out all your pretties! I will be linking up to some great parties this week. There is so much inspiration! Hi Debbie! Thanks so much for stopping by My Sweet Things and leaving a comment. 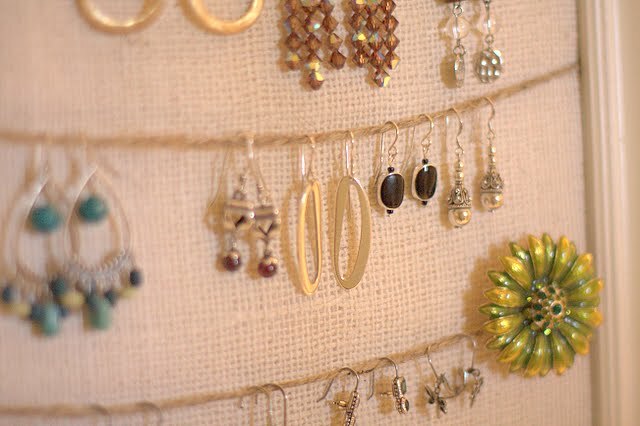 I use the earring holder on a daily basis and it gets me all accessorized more quickly! I’m having some trouble with feed burner pulling up my recent posts. This one is an older one. I am having my husband take a look to see what the issue is. He is my IT go to guy! Cheers to you and Happy Day! Love it and this would make a great gift too! I just discovered your blog – love your blog and this idea! I have the same problem of all my earrings getting mixed up in a pile in my jewelry box. I will definitely add this to my project list 🙂 Thanks for posting it! Great idea, thanks for the tutorial, I’m going to have to make this for my friend sometime soon (only in pink). what a great idea,i want one,make that 2!!!!!!!!!!! like some of those earrings! Hi! My name is Donna. 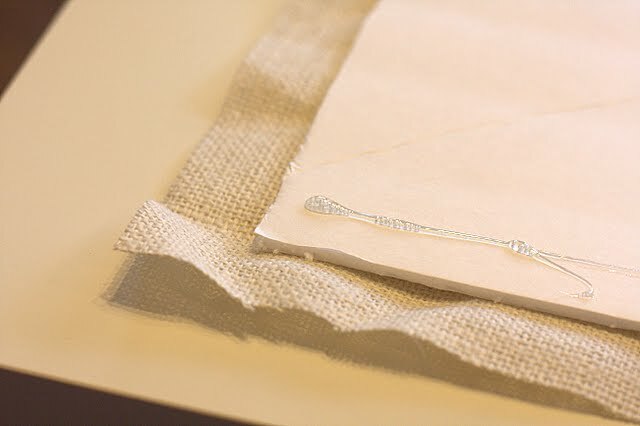 Welcome to My Sweet Things, a lifestyle blog featuring DIY projects and crafts for your home. Decorative Switch Plates Using Mod Podge!